One piece of gear that every responsible bowhunter should own is a high quality, dependable tree saw. 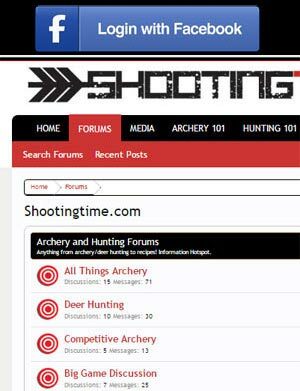 The best compound bow and arrows mean nothing if your shooting lanes haven’t been cleared properly. 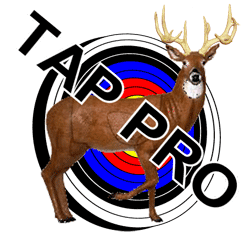 Clearing shooting lanes should be an annual tradition if any hunter wants to optimize their hunting success. If you don’t own a good tree saw, you should without a doubt, go and buy one. Which one should you get? Let’s look at some of the best options in the marketplace, the Hooyman extendable tree saws. Hooyman extendable tree saws, both the 5 foot and the 10 foot model, are the result of 3 years of extensive research and design. The Hooyman extendable tree saws are comprised of two parts: the folding hand saw and a telescopic extension arm. The folding tree saw is by far the best one that I have ever used to date. It has a great ergonomical design that allows for long periods of use. The frame is heavy duty and houses a vicious wood devouring blade. The MegaBite blade is made of premium high carbon steel and features a unique four edge tooth design that goes through wood with ease compared to the competition. One of the most important features to me with any folding saw is the blade lock. 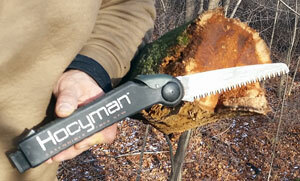 The blade lock on the Hooyman folding tree saw works flawlessly and is easy to operate. The Hooyman folding tree saw by itself is a powerful and useful piece of equipment. Although the Hooyman folding tree saw is the best we have ever used, what makes this system stand far above the rest is their unique extension arm system. The extension arms of these saws are engineered to perform and last through many years of use. Their patented I-beam design and internal technology delivers on strength and performance without slipping and bending while in use. The telescoping arm sections of the saw, which are made of aircraft grade aluminum, lock into place via the positive locking extension system. The locking system isn’t a friction system; the locks latch down into a special slots ensuring that the extensions will never slip while cutting. At the end of the extension arm is the receiver for the folding saw. Simply slide the bottom of the folding tree saw onto the receiver and “click”… you’re ready to clear some shooting lanes! My first impression of the saw was that the folding saw is very nice and compact. Coming in at around 13 inches, it fit into my backpack very well. After putting it together without looking at the directions, I went out to trim some branches in the yard that were a little overdue. It was amazingly easy to set up and get extended to full length. I started cutting some smaller branches which were really no big challenge for the saw. As I started cutting a few more I started to cut bigger and bigger branches. This culminated with me cutting a branch that was probably 5 inches in diameter 12 ½ feet off the ground (I did break out the tape measure on this one). I am 6’1” so this is 6’5″ above my head! This is what I would say is my maximum comfortable height to cut. Any branch higher and the sawing motion becomes more like calf raises. The saw was able to handle what I threw at it. bow saw. Its really nice to only need one tool to clear shooting lanes! I was actually turned on to this saw a couple of years prior to my purchase by my friend Tony who absolutely raved about his Hooyman saw. I indeed wanted to get a Hooyman saw, but because it cost more than a $6 bargain bin folding saw, I held off. After struggling with a cheap K-Mart folding saw that almost sent me to the ER due to a faulty locking system, I finally made the purchase. I decided to go big and got the Hooyman 10 foot model and am glad I did. Like I stated before, this is the only tool you need and you truly do get what you pay for. The extension arm is rock solid and along with the super sharp blade of the saw, it makes quick work of various sized branches. The guys at Hooyman got it right when they designed the locked blade angle of the folding saw. When using the extended saw, the blade angle helps deliver an excellent cutting force which eliminates a would be struggle. I have used this saw on the ground and from the treestand without any complaints. Over the years, I have cleared many shooting lanes and still have a razor sharp saw blade. This product lasts. The outstanding reach, quality build, and performance is why I give the Hooyman 10 foot extendable saw a score of 93.8 out of 100. For more information, visit their website at www.hooymansaws.com. This saw is probably the best extendable saw on the market.